RCom 4G LTE launch is expected across 12 telecom circles of Mumbai, Delhi, Kolkata, Gujarat, Andhra Pradesh, Maharashtra, Punjab, UP East and West, Odisha, Madhya Pradesh and Bihar this week. If you stay in any of these circles then you would soon be able to enjoy 4G LTE on Reliance Communications network. The news of RCom 4G LTE Delhi launch delighted me. Please check the attached network and Speedtest results screenshots to feast your eyes. Note: These tests were conducted on LTE Band #3 i.e. 1800 MHz. It is worth noting that the place (indoors) where the first screenshot was taken had very poor network coverage (-123 dBm). Now before you make any judgment about the network quality of RCom let me tell you another thing that at this place your phone can’t latch on easily to the leading telecom networks. Yes, this place has patchy cellular coverage. To give you a perspective about the network quality of RCom 4G LTE, let me tell you that at such poor network coverage, you can’t even make a call on 2G or 3G network. 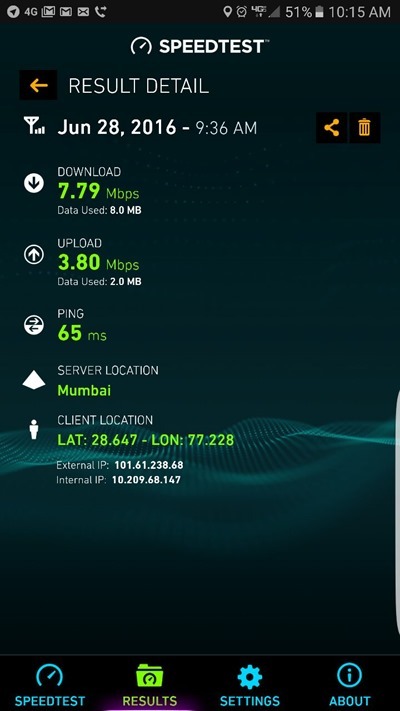 However, even with such poor signal strength, RCom 4G gave us 3.78 Mbps download speed and 0.42 Mbps upload speed, while having a latency of just 68 ms. In another Speedtest, again with poor signal strength of just -107 dBm, the download speed increased to 7.79 Mbps and the upload speed went to 3.8 Mbps while the latency improved slightly to 65 ms.
We are eagerly waiting for the RCom 4G LTE launch in Pune so we can test it ourselves and share the result with you. Source: This was reported by one of our loyal readers, Manan Somani from Delhi who deals in imported gadgets and has a keen eye for developments in the Indian telecom industry. You can connect with him via Facebook. "Exclusive: RCom 4G LTE Launched In Delhi. Offers Excellent Network Quality! ", 2 out of 5 based on 11 ratings. Old CDMA Pro3 speed was good enough but the new Rcom wi pod 4G speed is fake….I am getting only 2G speed…..RCOM how can u fool your loyal subscribers ??? India most fraud company reliance fooling the people and creating unnecessary hoax . I have 3 connection now iam quiting …for upgrading i lose 2697.00(899*3) rupees these instrument locked with reliance network you canot to go other network. indian most 420 company (reliance) ……… i decide port out. I am a Pune Pro 3 Postpaid “Truly Unlimited” customer since 2014 and reside in Deccan gymkhana (411004). I have the 4G WiPod but am confused and afraid of activating the 4G services, simply because 25Gb or 40GB is too less of data for me. I am a heavy downloader. My question is, currently my Pro 3 dongle is working, getting around 2mbps speed. If i try to activate the 4G Wipod or if i get it online, will my Pro 3 dongle automatically get deactivated? And how certain are we about postpaid plans? What is the use of 30mbps speed with a 25GB cap? I would rather have a 3mbps speed with no cap. If i watch a few hours of 1080p youtube videos, the 25GB will be gone. In the US, comcast and others have a 300GB cap for 4G customers, and they recently raised it to 1TB lol. But forget about the US. In Pune, to go from truly unlimited to 25gb cap and then download speed is at 144kbps? Its an insane impractical suggestion, i doubt if even a video at 360p will buffer properly at 144kbps. What would make sense to me, would be download 25GB at 30mbps in a month AND THE REST AT 3MBPS UNLIMITED, NOT 144KBPS. I would love to see someone browse youtube at 144kbps, expecially when they are used to 20+mbps in 4G. It will be an absolutely awful experience. So, good folks in Pune, what should i do? Is the data cap enforced at 25Gb when it will be launched at 9:30am on 30th June? i read a comment by a user ‘vikrant’ saying he downloaded 600gb lol is that serious? It seems fake because i am still unable to register on 4G or might be its particular sim issue. Please share the net velocity enterprise screenshot to confirm MCC and MNC code, Band used for 4G, Atleast MCC and MNC code is need to confirm the operator. Hii All, This is Nirbhay from Delhi. right Now i am staying in Naharpur Village, Sector-7, Rohini-85 i am not getting the Reliance 4G Network on above mention area. Also i am getting 2G Network in my area. I am requested to all of you please take a proper action about RCOM. 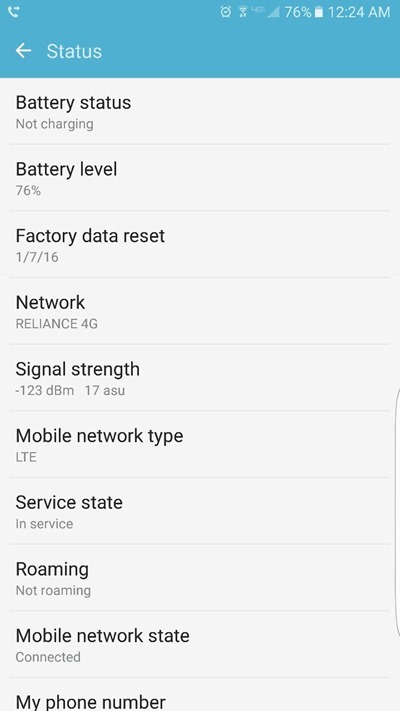 What are the rates they RCom has applied for 4G in Delhi?